Hey there friends. I'm flyin' solo for a few days because the hubby is in Colorado for work. I had him hurry and take some outfit photos for me before he left! That guy is becoming quite the jet setter these days with all of his work trips and he is going to Europe next month WITHOUT ME. So lame. He gets to hang out in Switzerland and Sweden, that lucky duck. All is well though because Carson and I will get plenty of momma-son bonding time which I never can get too much of. In other news, we are moving next month! Coincidentally, our move-in date is during the week Steven will be gone, so I can either move without him or stay put until he gets back... we all know which option I will be choosing. Happy almost Friday! Love this simple look, you are so cute! That top is super pretty. I'd be SO mad if my Hubby got to go to Europe and didn't bring me! Thanks! And I know, right? It's so not fair that he gets to go without me! Love this floral top! So cute! Love this entire look! Beautiful! 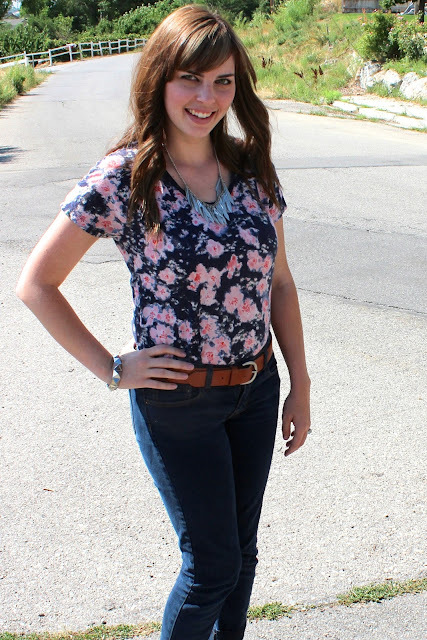 love the floral top tucked in! super cute look! hey hottie! just nominated you for the liebster awardy ward. 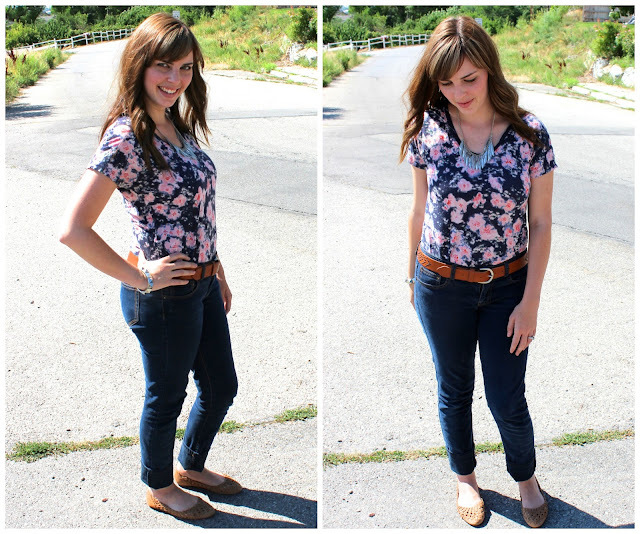 This floral top is really pretty, and I love those flats! lol i just want to keep following over and over again! Well I'm glad you're so excited to follow! Haha. follow back if ya like! Thanks! I'll check out your blog right now! Thanks for linking up with Friday's Fab Favorites! Love floral tops for the summer...or any season really. 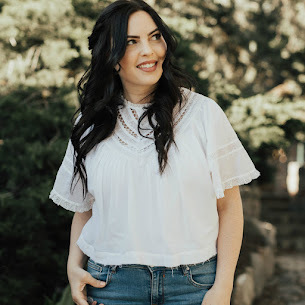 Thanks for linking up for Favorite Fashion Friday. Hope to see you back tomorrow!